Urban has a new and lovely emporium which opened today in the newly redeveloped School Yard in Harborne. The decor and atmosphere feels warm and homely and I’m really digging the open bar vibe as well. Here’s some pics from the soft-launch party last night. I urge you all to get over and check this place out. A fab job has been done by all concerned! Let us know what you think of Urban’s new emporium in Harborne – tweet to @coffeebrum!! At Coffee Birmingham, we are delighted to welcome Iona Burchell, a freelance writer and mum, to guest blog about her favourite family-friendly coffee spots in Birmingham. After reading this, we’d love to know what your family favourite independent coffee spaces are and why? Drop us a tweet and let us know and we’ll pass on your comments too. Enjoy! Kings Heath High Street is flourishing and showing the way forward for other high streets across the UK. It’s busy, bustling and bountiful. As a mum of two young children, and because it’s such a busy place, more often than not a trip to the shops on the high street needs to be accompanied by an ‘incentive’ otherwise it just becomes a stressful moaning session. Both offer activities for the children to play with whilst inside. Both offer free wi-fi. My favourite though is Loco Lounge. It’s light, spacious and has plenty of comfy sofas in which to sink whilst taking a break. It’s also got a lovely range of customers, from fellow parents to those having work meetings, to those on office outings and everything in between. The other reason it’s fab-they do a Babyccino of chocolate and milk. Perfect. My children love the croissants, I love the plastic cups and straws. The children love the games, I love to sit for a moment and watch them playing (destroying) Jenga or Connect Four. I’d love to sneak a peak at the complimentary papers, but that’s not going to happen anytime soon. But I enjoy not feeling hassled to move on once our drinks have had their final slurp. I recommend the hot chocolate topped with marshmallows-a small meal in itself. My husband recommends the Macchiato for coffee lovers. And you have the added bonus of knowing that Loco Lounge supports www.coffeekids.org too. There’s food as well as plenty of choice to drink. May I heartily recommend the eggy bread or pancakes drizzled with maple syrup. For an extra special treat you can add bacon to the mix too … absolutely gorgeous! Iona Burchell is a freelance writer and copy writer. You can find her on her blog where she spends time documenting her attempts to be a good enough mum. She is also on twitter @redpeffer. 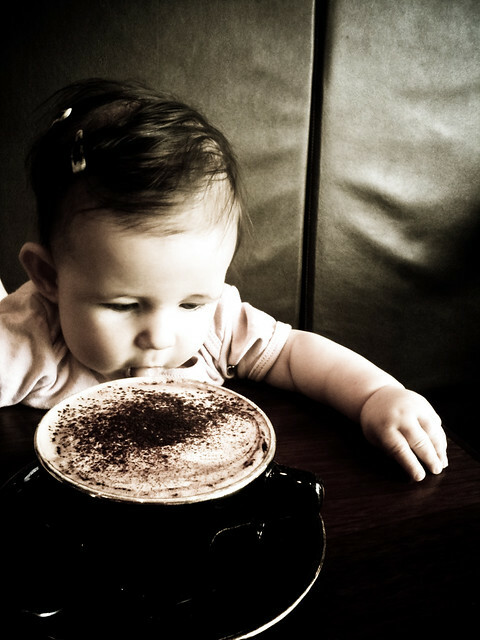 Which are your favourite family coffee places to go in Brum and why? Join in the conversation. Let us know @coffeebrum.